– Restore-A-Deck had little to no fading at the 2-year mark. Excellent color retention should be achieved through years 2-3 as well based on initial pictures and testing. See below for picture. –At the 2-year mark, there was no wearing or peeling. – We applied two coats to our 150 Sq foot deck that included all railings and steps. Less than 1 gallon was used for this at a total cost of $40. This equates to $.30 a square foot. Very reasonable pricing and better than most other top brands. 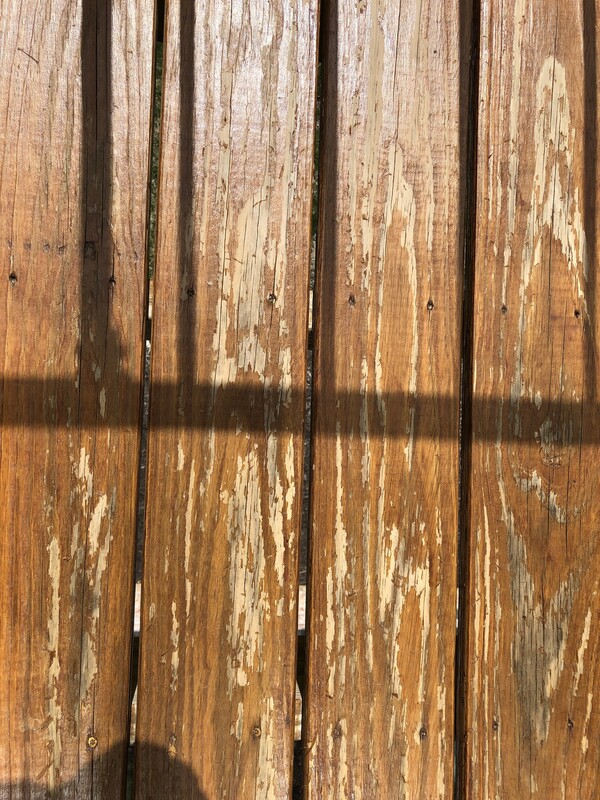 – Similar to other water-based deck stains, the Restore-A-Deck Wood stain will not promote the growth of mold or mildew. This is one of the main advantages of using a water-based coating. 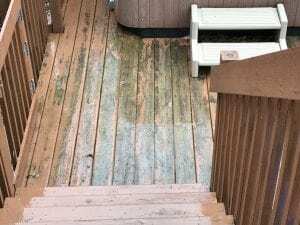 At the 1-year mark, the deck showed no signs of any mold or mildew. – Our favorite aspect of the Restore-A-Deck Wood stain is the ability to stain and prep on the same day! 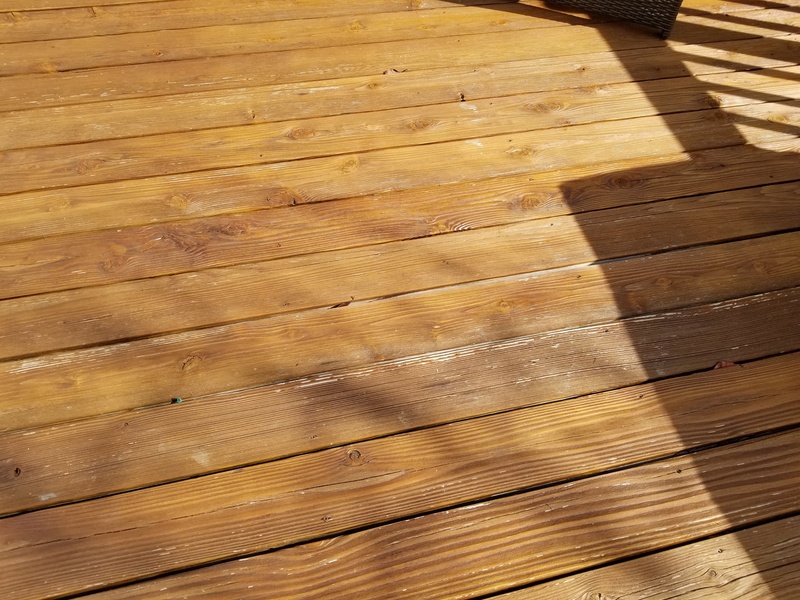 We tested this by cleaning and brightening the wood with the Step 1 and Step 2 Restore A Deck Cleaner/Brightener Kit and then applying the RAD stain 1 hour after the prep. The wood was visibly wet on a few areas of the deck and damp to the touch throughout. 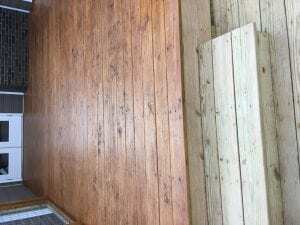 The Restore-A-Deck actually applied easier to the damp wood than any other water-based stain that we have used previously. We also found that the coverage was better when applied to damp wood. In theory, the stain will actually absorb better when applied to damp wood. The water “swells” the wood pores and “pulls” the stain deep into the wood as it dries. 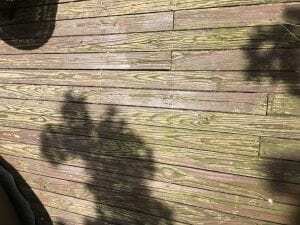 applying to damp wood will also help avoid potential issues with Applying a Deck Stain in Full Sun. – As expected there was very little darkening for the Restore-A-Deck Stain or color shifting. See picture at 2-year mark above. – The Restore-A-Deck will be an easy clean and reapplication as needed. – The Restore-A-Deck is an awesome exterior wood stain and has shown the ability to outperform other water-based and oil-based wood stains. 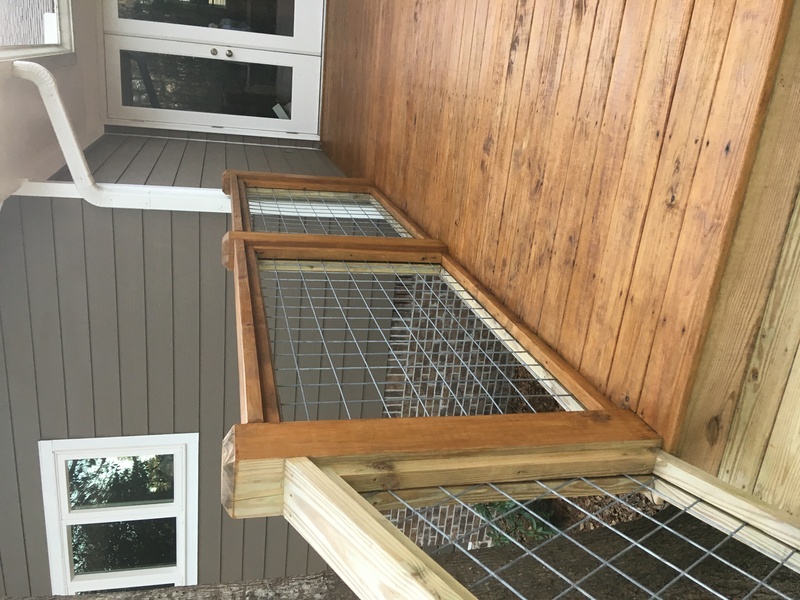 Restore-A-Deck’s 3-Step system allows you to save time and money when it comes to restoring your exterior wood and decking. No other system that we have used or tested has allowed the ability to Prep and Stain in the Same Day. 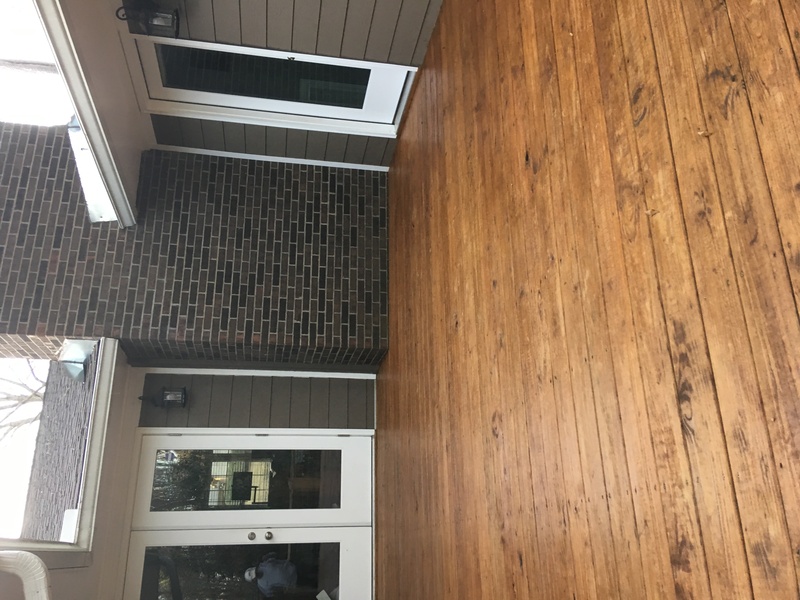 If you are looking for the future of exterior wood and deck stain, then you should consider the Restore A Deck Wood Stain and their prepping system. Cost: $39.99 per Gallon, $89.99 per 2.5 Gallon Pail, $179.98 per 5 Gallon Pail. Products ship free on their website. Coats Required: 2 Coats. “Wet on Wet” for older wood. New wood = 1 Coat. Just cleaned and brightened my 2 year old pressure treated pine deck. Then applied the light walnut stain, all from Restore A Deck. It looks great. Post a picture or two if you have time. Ken, can you try the pictures again when you have time. The issue with uploading images has been fixed. 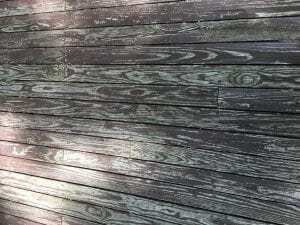 Have new Cypress Siding and Pressure-Treated Pine Deck – both kiln dried. 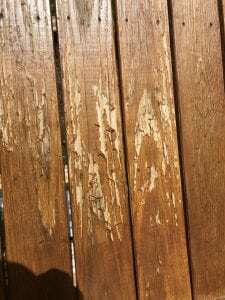 Do I need to wait a couple months to apply Restore-A-Deck like some other products? And is the prep-kit still needed on new wood? I also note it comes in Natural and Cedar – I assume Natural would not preform with UV as well as Cedar due to less pigment? Thanks! Hi. Can this product be applied to treated wood? If not, what is best for treated wood? We replaced deck floor with composite. This is for the deck walls. Thank you! 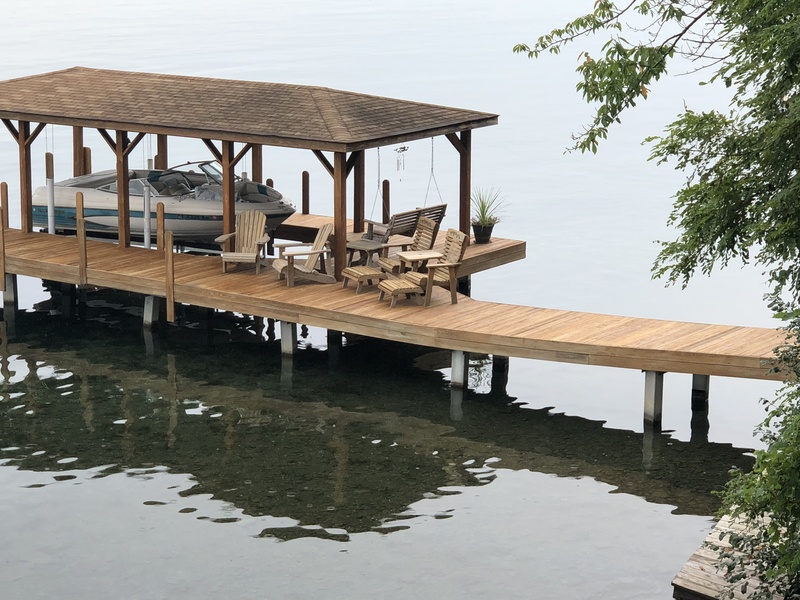 We used to restore a deck system on “new” treated lumber that was almost 2-years-old. Unfortunately we have had significant pealing especially where it was exposed to direct sun. How do we recover from this crisis? I don’t understand what went wrong? The prep, bleach and staining was done over two days in October 2018, we are in SE Iowa. Your pictures clearly show an extreme over application of the stain. The RAD stain is a penetrating stain that when applied correctly, fully soaks into the wood and does not create a shiny finish or dries to a film on top of the wood. In your pictures, it shows that too much stain was applied (very shiny) and it never had a chance to soak in fully. The stain is lifting from the surface because of this. Doesn’t matter what brand of penetrating stain that you would have used, you would have had the same result if over applied. The RAD is also supposed to be applied wet on wet if doing two coats. Not sure if you did this but if you applied wet on dry, that could create the issue. As to fixing it, best to strip and start over. Applying only as much as the wood can absorb and you will not repeat the issue. I had new pressure treated deck installed last August. Approximately 20′ x 30′ (600sf). I had planned to clear seal and let deck grey naturally. After reading your site comments, I am considering using light stain for UV protection. What do you recommend regarding color and amount of product? 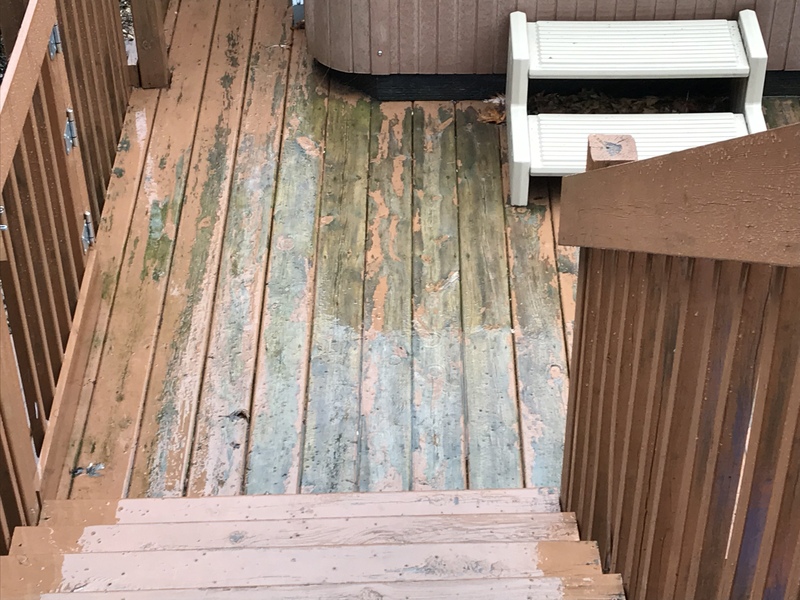 We have an older deck that looks like it had a semi-transparent stain put on many years ago. It is definitely not paint – can see all of the wood grain. We would like to use RAD. Do we need to strip the deck before using RAD? Yes. Strip and brighten the wood. We replaced our deck railing last March. Was told to wait 6 months to stain. Unfortunately, last year was a very wet year in WV (we are about 90 miles NW of Washington, DC) and we could not get the railing stained last year. What should I do to prep the wood and which stain (probably want a semitransparent) would you recommend for our area. Deck is pretty much in full sun all day. The wood parts are the frame for the top and bottom (2×4’s) and the 4×4 posts. The middle section is made from cattle fencing which we primed and painted black (no wood spindles). We get to enjoy the view so much more with this than with the wood spindle. 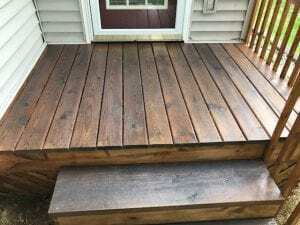 Clean and brighten the wood with the Restore A Deck Kits. 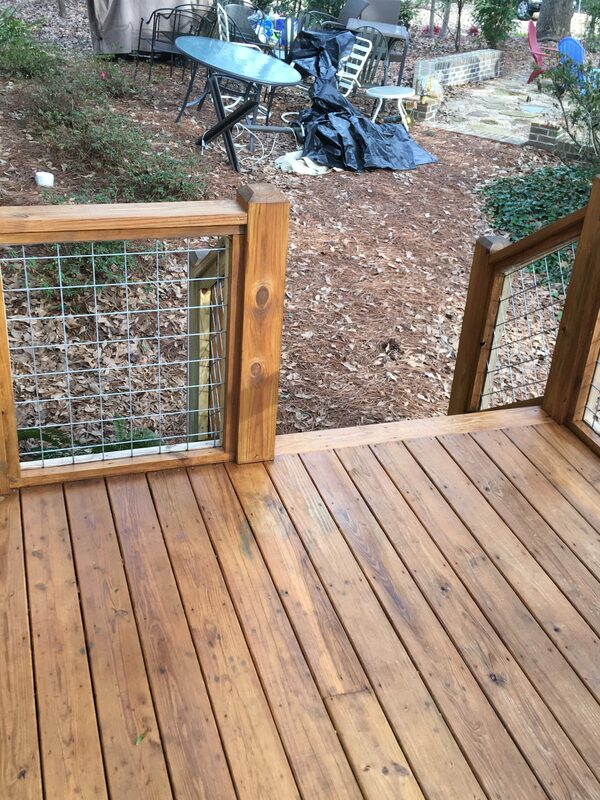 Stain with the Restore A Deck Wood Stain. Purchased the sample package. Thoroughly cleaned a small area and applied all 4 colors to the damp boards. 2 hrs later looked at the sample area and they all looked the same with very little tint. I’m glad to have purchased the samples because after all the positive reviews I almost purchased the 8 gallons needed to stain my deck. So much for positive product reviews on the internet. Really? It is impossible for 4 clearly different colors to all “stain” the same color so something had to have been done incorrectly in the prep or application for the stain colors to not take correctly. My water base stain was red maple. Which product should I use. An where to purchase. 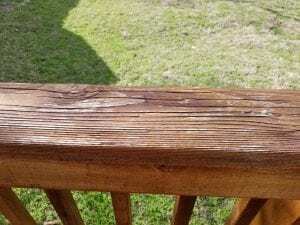 This restore a deck stain. I am sorry but I do not know what brand of stain that “red maple” is. We would need to know the brand name and the type of stain to determine how to prep and what to use after. Pictures would help as well. 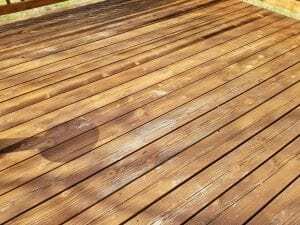 Restore A Deck Stain is a penetrating stain. It is not slippery when wet. As we mentioned previously, we do not what brand of stain that “red maple” is. We would need to know the brand name and the type of stain to determine how to prep and what to use after. Pictures would help as well. We live in central Indiana and had a new cedar fence installed in late Sept 2018. 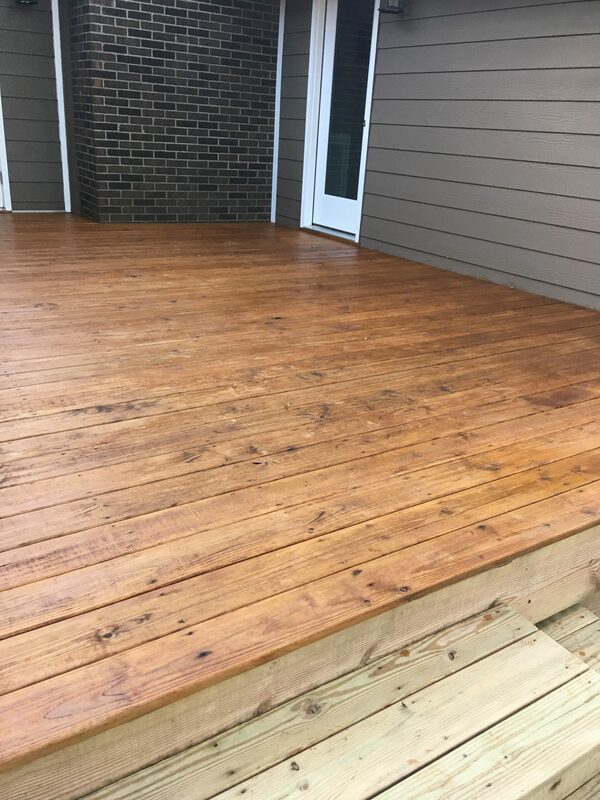 We let it weather over the winter and would like to prep and stain it with RAD cedar stain this Spring (2019). The fence is 6’ tall and 120’ long totaling 720 sqft on one side. Since it is new wood, I gather it will take two coats of stain. I plan to spray it on and back wipe it with the stain brush you sell. My question is: How much cleaner, Brightener, and stain should I buy? 10-15 gallons of the stain if doing both sides. That will vary based on the porosity of the wood. 2-3 each of the cleaner and brightener should work. How Much Cleaning / Stripping / Brightening should be necessary if using Restore-a-deck over Olympic Maximum that was applied in 2015? The Olympic still looks pretty decent, but after readying mixed reviews and your review, I am thinking of switching. There has been No pealing, some fading, But is not exposed to full noon sun in most areas (covered). Present color is “Tobacco” which we really like and so also struggling to find a similar color – Dark Walnut? Also I am torn between an Oil or Water based. But I guess for an oil I would almost have to fully remove the Olympic? There are a whole lot of tight spots in the deck that would make full removal and sanding impossible. I have narrowed it down to 3 of your top choices: Armstrong-Clark / Restor-a-deck / or TWP 100. Thoughts? You will have to remove the Olympic no matter what when switching brands that are penetrating stains. Does not matter the type or stain brand you plan on using. We had a cedar pergola built in September. It is still unfinished. I wonder if this product would work. If so, will I also need to prep? It will work great for a pergola. Use the Restore A Deck Cleaner/Brightener Kit for the prep. You have to prep. Compared to other products, what makes this product ECO SAFE? It has a VOC content less than 100 and it does not have any harmful fumes, chemicals, or solvents. We did our deck 8 months ago, old wood but had never been stained. We did everything the instructions said from prep to stain and it took over 50 man-hours for our 600 sq foot deck. Now… it looks awful. It is peeling and dried looking everywhere. Pics are from now. We went with the highest rated stain and paid quite a bit more for it. Your issue is not a stain failure but an over application by whoever applied the stain. Restore-A-Deck is designed to fully soak into the wood. It cannot peel or wear if done correctly. In your picture, it shows that you applied too much stain to the point that it could not soak in but dry on top of the wood. That is why you are having issues in those areas. BTW, it should not take 50 hours to do a 600 sq foot deck. More like 5-6 total hours. 2-3 hours for prep and 2-3 hours to stain. If you spent more than 2-3 hours staining than that could also be part of your issue. It applies fast and easy and the second coat must be applied wet on wet. That means 20-30 minutes after the first coat. 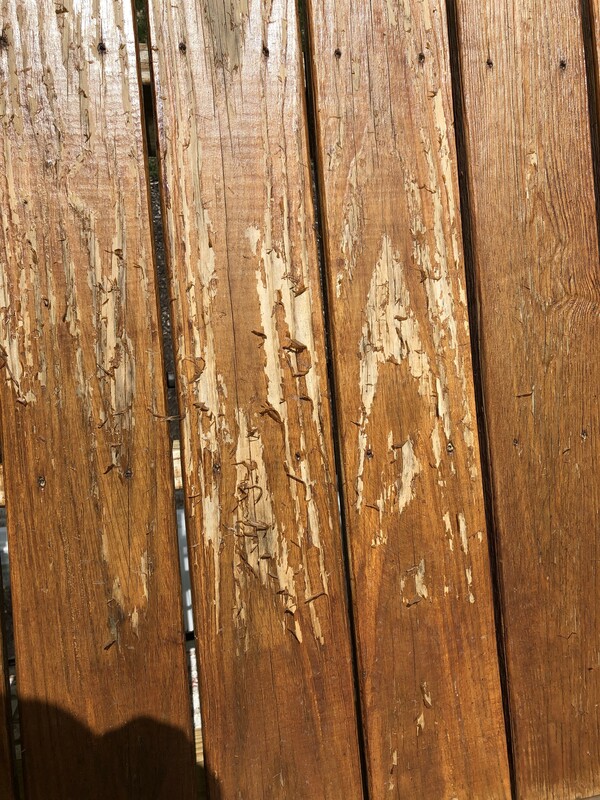 If you applied your second coat to dry stain, then it could be prone to issues like this. Thank you, I wonder if having it too hot outside means the first coat dried too soon (we did the 20-4- miute, erring on the side of 20, but still HOT outside in July, een in the early morning), so then it had this result. What is the optimal temperature range? Most of that time was prep so it is disheartening now to see this. What steps do we need to redo the horizontal surfaces? The vertial surfaces are all find, which is a relief because that is all the fine rails and spindles. Thank you! Lightly strip or wash off the floors. Brighten after. Apply the RAD again. It will be easy since you are just doing the horizontals. Temp range for applying is best at 60-80 and not in direct sunlight if possible. Later in the day or earlier in the day. I’m contemplating getting Restore-A-Deck and using the Natural. If I decide I want a darker stain when I add the second coat as recommended in 12 to 24 months, can I use a different color? Or would is look wonky? Thank you. You can go darker but you always have to prep before reapplying. And prepping before reapplying is true for staying with the same color or going darker, correct? 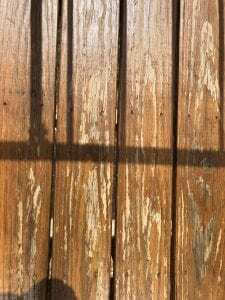 Where can I buy Restore-A-Deck Wood Stain? I live in the Oakland CA hills and have a large redwood deck. 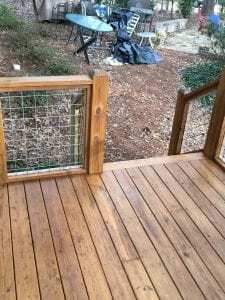 The deck is over 10 years old but it’s very good quality redwood and in decent shape. 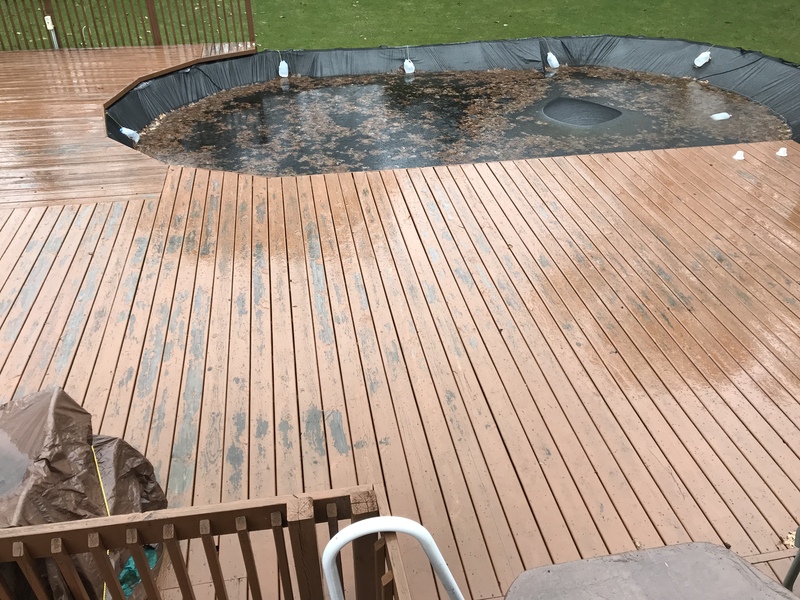 It was power washed, cleaned, and stained 4 years ago; I believe Superdeck was applied. The new contractor wants to clean and sand the decks, and then use Behr Premium but I read the reviews and now I’m very skeptical. Since Restore-A-Deck is highly recommended on this site I’m considering asking the contractor to use it instead. My question is that I don’t see a redwood natural color offered. The RAD website shows a natural color but it’s very light. I want the natural redwood color to show; will the RAD “natural semi-transparent” color stain do that? If so, there needs to be a redwood sample used with to show that. Natural in the RAD stain will enhance the natural grain of your wood similar to a wet look. If you want a little more red than that, then use the Light Walnut. 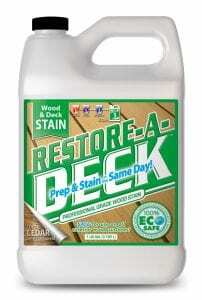 Where did you buy the restore a deck stain? I used this stain last Spring and so far so good. No issues at all and is holding the same color as when applied. Question though. When it is time to reapply, do I have to prep with the Restore A Deck 2 part system again? Yes. You always have to prep when reapplying. This will ensure that the new coating will adhere well. Thanks. Do I need the Brightener or the Cleaner for the prep when reapplying. Cleaner for sure to remove any dirt and grime. Use the Brightener after to neutralize. Because of all the rain this summer in the Northeast I’ve never gotten a chance to treat some of the cedar wood I’ve replaced on my deck. Is it safe to go through a winter without treatment? If not, then what is the lowest temp.I can apply to the deck? I’m assuming 50 degrees F but what about the cold nights? Will the product dry properly? You will be fine to wait until Spring. 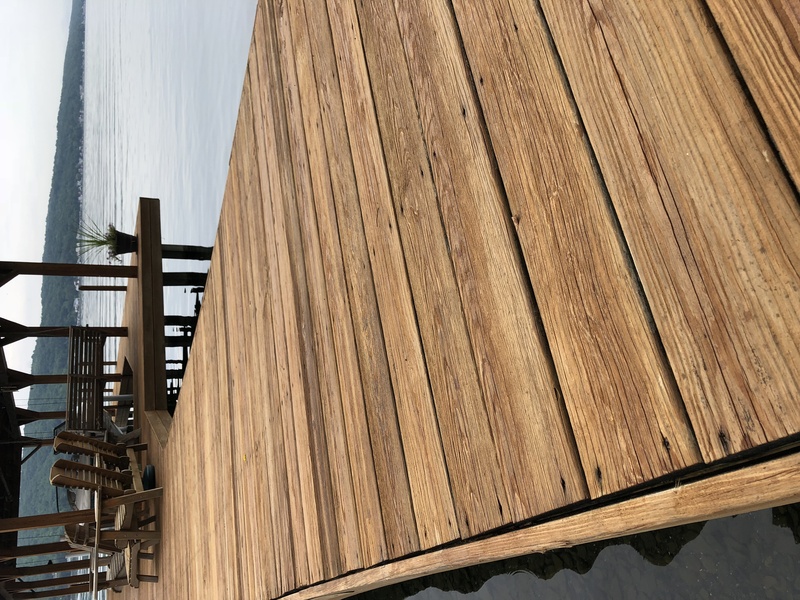 I noticed that Restore a Deck says that the product can be used on hardwoods such as mahogany, but does not warrant the product for use on such hardwoods. They say that if used on hardwoods, you may have to reapply every year. Has this been your experience for use on mahogany, or do you find that reapplication every year may not be necessary. I live in Massachusetts. Deck is in the shade mostly from October to March and partially in the sun in the summer months. All exotic hardwoods require an annual recoating. No stain will last longer than a year. 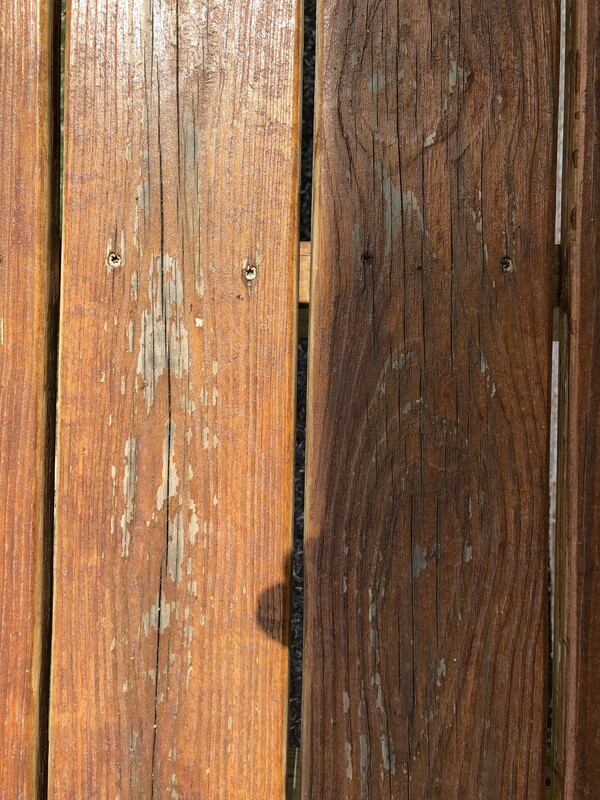 I had a contractor stained (sprayed) my 2 year old deck with Ready Seal approximately 15 months ago. I had it pressure washed (using low pressure) about 2 months ago. I want to change to Restore A Deck as I live in NC and a water based product will work better in this humid climate. 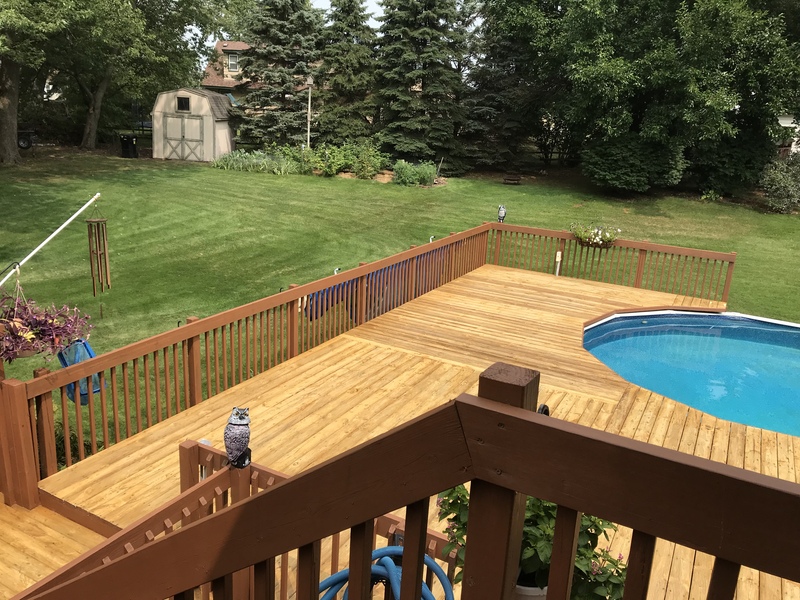 The deck looks good and since it’s been washed recently, will I need to do any prep before I apply Restore A Deck product? You will need to strip it and remove all the RS as the RAD cannot go over top of it. Brightener after the stripping. 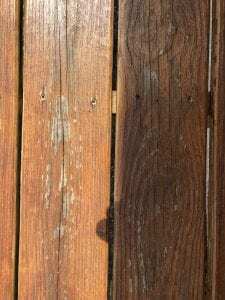 Can restore a deck stain be used on ipe wood? Yes it can. Works very well. 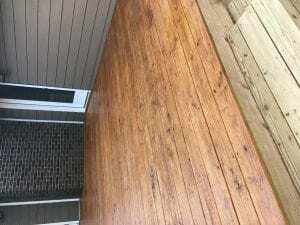 We purchased redwood at extra cost for our deck and applied Sikkens as recommended by the lumber store. It did not even last a year, mold and mildew appeared and worn out places. Next we tried Sherwin Williams super deck product and was told we should expect it to last three years. Once again barely over a year and we have worn out places and mold. We live in Georgia hot and humid, on a lake. Our deck is barely 6 yrs old and we are looking to redo it for the 3rd time. Please help! Strip it all off and brighten the wood. Use the RAD Wood Stain. New deck installed early in the Spring, 2018 in Maryland. Husband got antsy and coated it with a clear sealer about 2-3 months later. Water still beads up on it. Do we have to strip it to apply a stain sealer now that we are prepared to pick a product to acheive the appearance we’d like? Yes, you have to remove the sealer first. Where can I purchase this product in Toronto Canada? You would have to order online to be shipped. 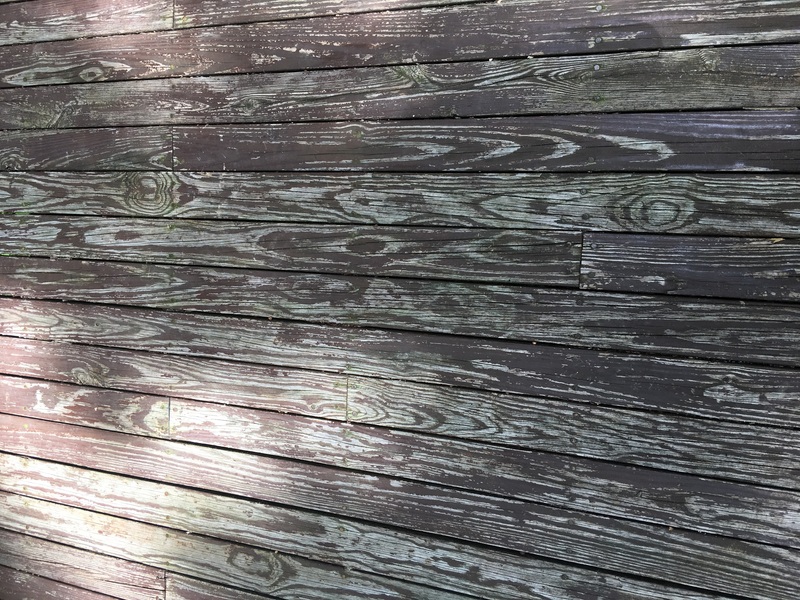 i have used a deck cleaner AND later power washed our pine pressure treated wood deck in order to get algae stains off deck but can’t seem to get them completely off all areas. Can I still stain or do i need to sand first? I don’t know what stain was used previously. Is it better to use the Cedar color vs the Natural for UV protection? I have read with stains its more effective to use one with a color. Thanks. Its for a new Cedar fence, smooth. Best to contact them for help locating. Put a new deck on December 2017 and let it weather for 10 months. I cleaned and then brightened the wood according to the directions. Waited 24 hours and applied the Reatore a Deck walnut stain with a stain brush 2 wet on wet coats. It looked while it was wet but after it dried it looks terrible. Very uneven colors and a splotchy look. I have used TWP and Ready Seal on other deck with out any problems. i wish I had went with one of those this time. Something must have gone wrong with your prep or application process because it always dries evenly for us. Feel free to post a picture. 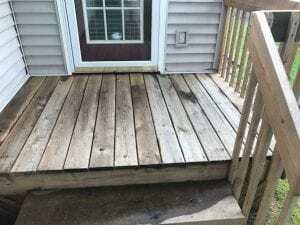 After stripping our deck disaster with Sherwin Williams deck scapes. Looks great now. Yes as long as the Teak is free of previous coatings. 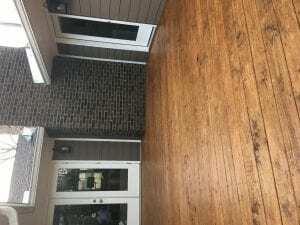 I HAVE a home with cedar shingles that were stained Olympic water repellant oilstain solid color about 15 years ago …..They have held up very well What would you reccommend I use for a stain this time around? If you used a solid stain before you will need a solid stain again. The RAD wood stain does not come in solid colors currently. Our deck was put in this week (pine). How long do we really have to wait to stain it? We are in Florida. Lots of rain and sun this summer. The RAD wood stain says 3+ months and prep after. 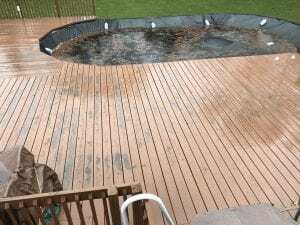 how long does the deck need to dry after stain application before getting wet from rain? Wood grain shows different colors when using a semi-transparent stain. Also, the age of the wood, the application of the stain, and prepping of the wood can determine the final color results. Post a picture if you can. Looks normal for a semi-transparent stain. I would leave alone, you can always add a light coat in 9-2 months if needed. Thank you for the response. Appreciate your input and we’ll probably add another coat next year. Planning on sanding deck to bare wood totrmove multiple applicationss of solid stain. Do you recommend cleaning and brightening before application of RAD stain. Deck is covered with 3′ of snow during winter. Also, do you recommend two coats? Clean and brighten for prep after the sanding. Just one coat since you sanded. deck floor what amount of time before you can walk on it? 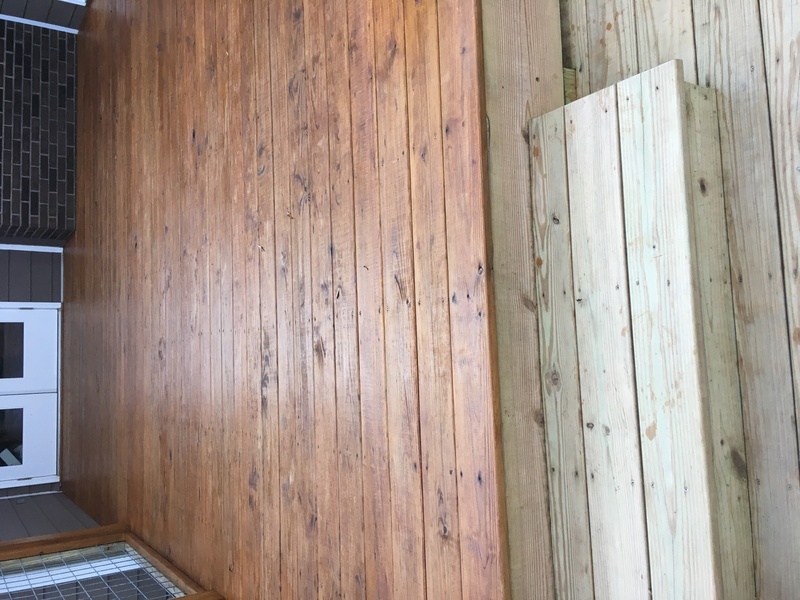 after application of the product to the deck floor ,when or what amount of time before it can be walked on? 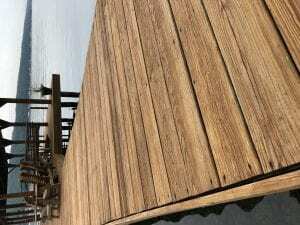 I live on a lake and I am looking for a deck brightener to use on a dock that is eco friendly. The Restore A Deck prep kits will work. I live in Arizona so of course, I need the best UV protecting stain out there. 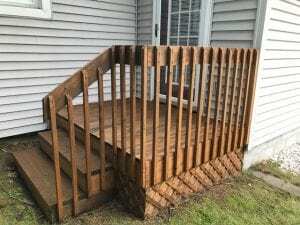 After extensive reading on your awesome site, I’m between Restore a Deck or Defy Extreme. Unless there is another one more suitable for our HOT, dry, and sunny weather that is better. Either one would work great. I have a Large Deck that has been neglected for years.. I pressure washed it with Deck Cleaner, now looks much better.. My question is ; Now what stain filler do you recommend ????? The wife wants to keep it light or natural looking, I think a darker stain would hide any blemish the wood has — YOUR THOUGHTS ?????? The RAD Wood stain should work well for this. Any color that you like. No idea what the old owners used. I think it is at least 20 years old. Good condition but dry and whatever they put on it last year before our purchase is about 50 percent gone. What product do you recommend to prep? Hoping for a semi solid that I could use a gray color. I have looked up all your recommendations but found an option in gray. Lastly, it gets high traffic and we have big dogs! Please help me wow my very handy husband when I pull this project off by myself!!! Thank you so much for all of your great advice! The RAD stain does not come in a gray or semi-solid colors. The only way to get a gray semi-solid is to custom tint and that means you will end up with a stain that films on top of the surface instead of penetrating into the surface. We bought TWP last year to stain our deck but we couldn’t get a good weather window last summer, so are just now approaching this project. 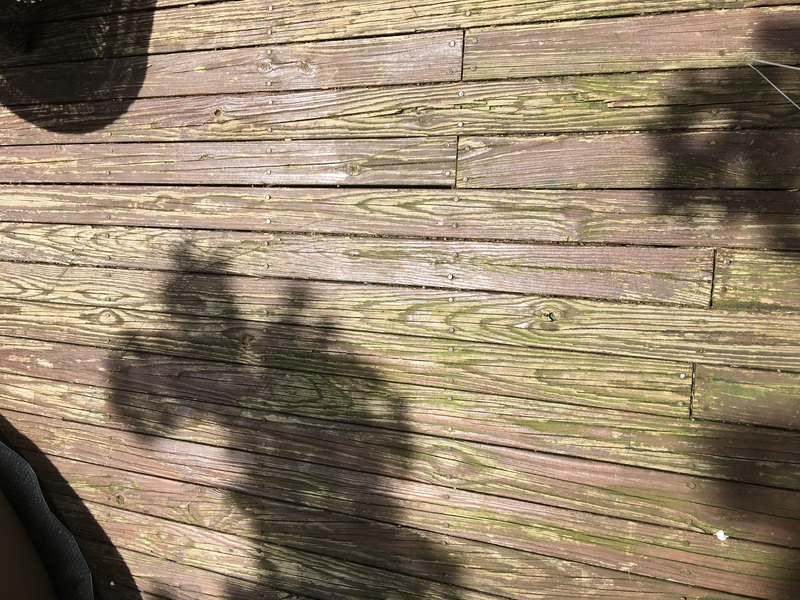 We stripped/cleaned (have some old and some new decking) and brightened it just yesterday. I just found out about this RAD stain this morning and we would much rather use a water based than an oil based stain. If we use the TWP this year (which has already been purchased), what process would be required next year to switch RAD stain? I ask as we are considering just taking a loss on the TWP and switching this year if it would be labor intensive to do so next year. Thank you! You will need to strip and brighten the wood for the prep. The TWP comes off easily. Can you put stain on a deck that still has some paint on it? If so would you recommend a solid stain? You should not stain over a paint. Sorry to ask this but I was wondering if there was a paint help sight set up just like this also. I was looking online for the best concrete sealers and found a site set up exactly like this for sealers and was wondering about paint also? Thanks.